All freshened up after our afternoon in the pool, we head over to the Beach Club Resort for our dinner at Cape May’s Clam Bake. Our ADR was for 6:50, but we went early and were seated within 15 minutes. 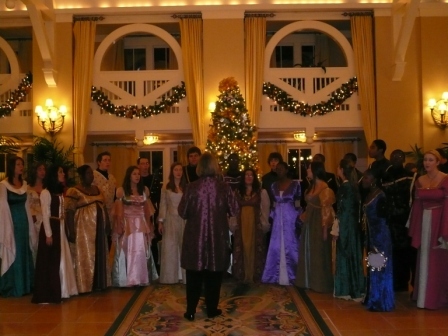 While we waited we listened to a choir group perform in the lobby. They were very good! I love all the “extra” stuff Disney does during the Holidays! Our server was Mary. I remember her name only because she has waited on us 3-4 times over the last 6 years. On our very 1st trip she taught DS to color on the mussel shells (after DH was done with them). I do miss the buckets they used to have for the clams & mussels, but they still tasted fantastic! DD & DS made out just fine with the non-seafood options. They had ribs, chicken w/pasta -from the adult buffet- and pizza, chicken strips, hot dogs & mac and cheese from the kiddie buffet. DH & I enjoyed the clams, mussels, clam chowder, peel & eat shrimp and more that I can’t remember. Of course we also had the oreo bon bons off the dessert buffet and maybe a few other desserts. After a very good dinner, we decided to go back to the room & change. The temps were dropping more than we had expected. By the time we were ready to walk back out the door, DS decided he was just too tired to go anywhere and he just wanted to go to sleep. We set up the beds (the kids don’t/won’t share a bed, so we had the sleeper sofa & a twin size aerobed in the living room) I gave DS my cell phone and told him to call us if he needed anything, then the 3 of us left to go watch Illuminations one more time, and see what else we were up to doing. It was Extra Magic Hours at Epcot that night. It was strange having 3 of us, with DD as the 3rd. Usually she’s the one off on her own, but DS looked like he’d be asleep before we got to the elevator. We made our way to Epcot and found a spot near Canada to watch Ilumminations. As soon as it was over (so sad) we went to Canada to check out the new movie. It had been on our “to do” list, but we hadn’t gotten to it until now. While we waited, we talked about calling DS and checking on him, but didn’t want to wake him up, so we head in to watch Martin Short tell us about Canada. Don’t you know that’s when the cell phone rings. He’s fine, just wants to know what we’re doing. We’ll call you back after the movie! Gotta say, this was a huge improvement over the old movie. DD decides she’s just to cold & too tired to stay. She heads back to go “relax” in the hot tub. Ok, we call DS back and he say’s great, he’ll put his suit on and wait for his sister. DH & I decide to stay and walk around the World Showcase. I don’t really know what possesed us, I’m so tired and my legs are killing me, but we go walk. From Canada we head towards Mexico. Stop in Norway to ride Maelstrom, then just wander for awhile. It’s so nice to just be a couple. DS calls and asks where his sister is. DH calls her, oh she had her suit on under her clothes and went straight to the hot tub! Called DS back, he goes to meet her. DH & I continue to walk (no other choice at this point!) We get to check out the shops in Germany and Italy. We slowly make it back to the International Gateway and catch a Friendship home. It’s midnight (somehow we did the whole EMH time we were so tired, we obviously weren’t moving fast) Got back to the villa, and no children. Call DD again and watch from our balcony as she got up to check her phone. She wants to know if we’re gonna join them; It’s 12:15am are you nuts??!! Oh my aching body. Ok, maybe the hot tub doesn’t sound too bad, DS really should have gone to sleep hours ago, he’s babbling incoherent statements, but happy as can be. After soaking for a little bit it’s time to go to bed. Gotta pack in the morning. One of the “problems” with the Disney Dining Plan is that by the time you eat an appetizer, entree and dessert, you’ve spent a lot of time eating. We caught our bus to Magic Kingdom, I grabbed our party tickets from Will Call and then we went for a ride on the Monorail. I had planned to check out the decorations at all of the monorail resorts, but after that long meal, we didn’t have time. Off to the Grand Floridian to see the famous (infamous?) gingerbread house. The first thing you see though is the tree, wow that’s big! and beautiful! We went downstairs to see the house and it was as impressive as always, but I wanted to get to the party! Back on the monorail and to MK. It’s almost 6pm when we walk in (an hour later than I had planned on) it’s very crowded up front, day people will be leaving soon but the party is sold out. We make our way up Main St, trying to not lose anyone. I’m more worried about losing Dad than my kids, lol! We stop in front of The Plaza as Wishes starts. My kids & DH take off to ride Space Mtn, while Dad, Jackie and I watch the fireworks. That was pretty neat, Wishes isn’t my favorite, but I really enjoyed it this time. Maybe it was because of the wide eye awe of Dad & Jackies faces… We head to Tomorrowland to find the rest of my family and find out that they rode Buzz Lightyear instead because Space Mountain had a 40 minute wait. So we promise DS –who swears that he wants to ride all of the roller coasters on this trip. We’ve heard this before, and then he ends up “not in the mood” so we’ll see this time. Anyways, we promise that we will ride Space Mountain later when the line goes down. So we walk, and Indy Cars have a 10minute wait?!? DS usually wants to ride in June in the 100+ heat with an hour wait, so 10 minutes, go ride! Off they go while DH & I enjoy a few minutes alone. Next we make our way to Fantasy Land. The park was crowded, but we found most of the lines to be 10 minutes or less. Jackie & I watched while the rest rode Cindy’s Carousel, then since they had loved Muppet Vision we were headed to Mickey’s Philharmagic. We told them how the technology improvements puts Muppet Vision to shame, we walk in, stand in line for a few minutes and then see the people at the front of the line leave. Huh? What’s going on? I have to say this was the worst managed thing all trip. Word spread through the guests that something broke and they weren’t sure when it would be fixed. There was a Cast Memeber at the front of the line, but they never “announced” to the rest of us and it took another 5 minutes or so before they put a Cast Memeber at the door to let people know what was happening. Bummer, no Philharmagic. So we moved on to Snow Whites Scary Adventure, 5 min wait, then Small World, where we walked right on. Everything was nice & clean and bright, good job on the refurb. Dad & Jackie thought it was really neat. Skipped Pooh Bear & Peter Pan for now because the lines were longer and made our way towards the back of the park. It’s been awhile since we’ve eaten, so it’s time to get cookies & cocoa. We sat outside Columbia Harbor House, ate our cookies and listened to carolers. I love the Christmas Party! The weather was good, I was wearing jeans, t-shirt and had a sweatshirt tied around my waist and I was perfectly comfortable. We finished our snack and went to Haunted Mansion. We walked right in, I was actually a little bummed because I didn’t get to see everything outside and this was our 1st time back since it went thru refurb. WOW!!! They did a Fantastic job on the refurb! And seeing Dad & Jackies faces when the hitchhiker joined them was priceless! It was almost time for the 1st parade so we scooted through Frontier Land and headed to Splash Mtn. This was not Dad & Jackies thing, so they went to shop & watch the parade. Splash had a 10 minute wait posted, but it was actually only as long as it took to walk thru the queue to the boats. 1st Mtn of the night. DH & DS (who’s awfully brave all of a sudden) get the 1st row, DD & I 2nd row. Y’all know “the big drop”, well next to that is where the boats go first, to go up. Timing is everything as they say, and as we went up, a boat came down and I caught their splash full on! Yep, my entire right side was soaked! I’ve still got the rest of the ride to get through and then there it is, the big drop. DS is loving this and at the bottom, he ducks. Did I mention he’s right in front of me? Yeah, what wasn’t wet already, has now been taken care of and DS, he’s laughing hysterically! He’s not the biggest 10 year old, his head doesn’t even come to the top of the seat on the boat, so he really wouldn’t have blocked much of the water but it was the principle of it. DD complains about being wet until we get to the ladies room and she sees just how wet I am. Thankfully she’s smart enough to stop complaining. Well, the parade is still going and Big Thunder Mountain Railroad says 20 minutes. I say no thanks, I’m too wet, you all go ahead. So DH, DD & DS walk in and the wait sign switches to 10 min. That’s 2 Mountains in one night now for DS and he’s happy and excited. Is my baby growing up? The parade is finally over so we try to find Dad & Jackie. Cell phones are wonderful things, when people answer them! I’m learning that Dad has his in a holster on his hip, and he doesn’t hear it, ever! Somehow the kids see them in the crowd and we catch up. Time is really flying, not too long till Holiday Wishes. We head towards Pirates to see how long the wait is, yay! 5 minutes. I love walking on to rides! Love the Davey Jones things, and Capt Jack Sparrow is so life like, my DS still doesn’t believe me that it’s not a real person. Wow, we’ve gotten through just about everything that we thought Dad & Jackie would be interested in. We walk up towards Crystal Palace, get a spot to watch the fireworks and DD gets us more cookies & cocoa. I was really liking the warm cocoa, I wasn’t dripping anymore, but I certainly wasn’t anywhere near dry. Thank goodness that it was so nice that night, not like Sun/Mon nights! Wishes was good, Holiday Wishes was really good. Dad was just amazed, he’s never seen anything like this before. After the fireworks Dad & Jackie are ready to call it a night. We walk towards Main St with them and say good night. Back to Tomorrowland! First we decide to check out the shops and look at sweatshirts. 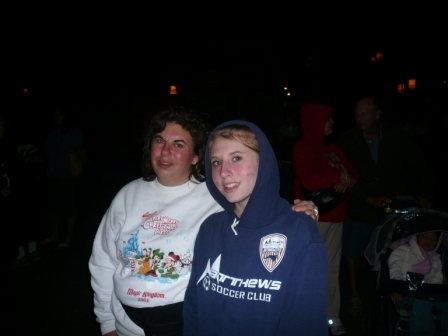 The party sweatshirt was ok, but not as nice as the one from 2001 that was tied around my waist. Now DD is getting hungry, really? I’m still full from lunch. Since it’s almost time for the 2nd parade we head to Pecos Bill’s, she get’s Counter Service and we watch the parade from the benches on the porch. Maybe not the best view, but we were sitting. We got some extra fries & a coke to share and everyone started to perk back up. Back through Fantasy Land and I finally get to ride Pooh Bear. Don’t ask me why, but I love this ride. I usually skip it because it always has long lines, but now it’s 5 minutes! Then we catch Peter Pan, it say’s 20 minutes, but was closer to 10. Allright, back to Tomorrow Land. DS still wants to go on Space Mountain. 10 minutes, all right let’s go. There he is in the 1st row again, in the past he would get off a ride, we’d ask “did u like it?” he’d say “ya, but I don’t want to go again” now he’s in the 1st row on Space Mountain?! I haven’t been on this in years, I forgot how much fun it is! DS wants to go again! Wait, I didn’t get to go on Buzz yet and it’s 11:30. So we go ride Buzz, DD & I lose to the boys yet again and then back to Space Mountain. It’s almost midnight, but here we go again. I can’t believe we’re still riding rides and everyone is happy at the end of the party! We make our way out of the park, sad that we never made it to Main St during the party. We missed the snow! Wow, what a magical party. 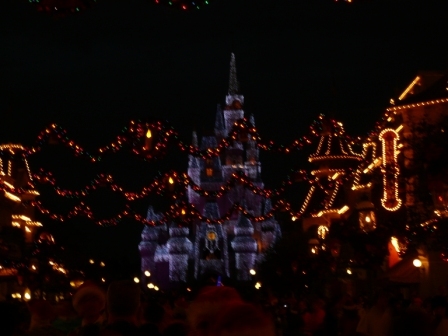 The castle lights were amazing, everyone had fun and was happy and DS hit all 3 mountains in one night . Triple Mountain Whammy accomplished! There really is a Santa Claus! Lot’s of eating scheduled, I hope Dad & Jackie find their way! It’s now Monday morning, the first full day of the trip for Dad & Jackie. Oh, and it’s really cold! 38 degrees!!! I thought we were in Orlando, but apparently we were at the North Pole. Todays plan is to “show” dad the value of the DDP. Breakfast at Cape May Cafe (BC), day at Epcot and Les Chefs de France for dinner immediately followed by the holiday Illuminations. I had watched the weather for weeks, up to the day we left and never were 30’s in the forecast, so all I packed were a few sweatshirts and a golf windbreaker for myself. Talked to Dad and told him that breakfast was at 10:20, so they should leave SSR by 9:20. Take a bus to the Studios and then get on the boat that we rode on yesterday to Boardwalk Villas and we’ll meet you there. Well, in their defense it had been really dark when we were on the boat Sunday and they were tired. At 10am Dad calls and says they can’t find the boat they’ve looked all around in the park and can’t find it. “Ok, Dad where are you now? Outside the gate, good, facing the gate look to your right and you’ll see the boat dock.” OMG, it’s gonna be a long day! We tell them to just stay on the boat till it gets to the beach club and we meet them there. When they show up Dad is wearing a new hat, that he bought in the Studios that morning. Guess it’s a really good thing they got those park hoppers after all! Now the Beach Club is one of my favorite places, especially at holiday time. 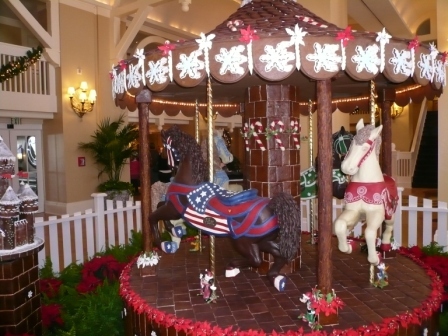 The gingerbread carousel with the chocolate horses is unbelieveable! It smells sooooo good! We check that out while waiting for our table (we were only about 10 minutes late). Breakfast is great, DS can eat a breakfast buffet like an adult with no problem, so he was very happy. Dad & Jackie both loved all the food and then were surprised with the characters. Did I forget to mention that it’s a character breakfast?? 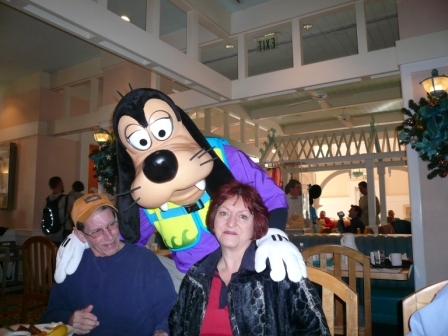 Goofy coming up behind my dad was pretty funny! DD is not a morning person or a breakfast person and was very disappointed that the hashbrowns they used to serve weren’t on the buffet. Her mood is slipping fast (as teenagers are known to do) so when she asked to go back to the room for awhile and meet up with us later it sounded like a good idea. So she got her 1st taste of freedom of the trip. She had her room key (with charging privileges) and her AP. Bye! The rest of us finished a very good breakfast and left feeling very full. Won’t be riding Mission Space anytime soon. We walked over to Epcot and once inside, DH collected all the passes (except DD’s) and he & DS ran over to Soarin to get fp’s. Dad Jackie & I strolled through the World Traveller, and most of the shops in England and some of Canada. We then met up with DH & DS and headed over to Test Track & Mission Space. Test Track had a long wait (shocking, I know) so we went to Mission Space. DD called and was on her way to meet us, so I waited for her while DH, DS, Dad & Jackie went on Mission Space. We decided it would be safer for dad to go on the green version. I waited for DD, who arrived just after the others went into Mission Space. She loves Test Trace, so she took off to ride the single rider line real quick. Here I am, all by myself. Oh well, I sit in the sun and try to stay warm. DD is back from Test Trace and we’re still waiting on the rest of the group. There they are! Dad looks a little green, oops forgot that he’s very claustrophobic. He liked the ride, just not the capsule closing around him. DH had warned Jackie to look straight ahead at all times, and she did fine. Thought it was pretty cool. Now we make our way to Innoventions, DS plays some robot building game that takes forever, Dad wanders off to who knows where, so Jackie, DD & I go see the house of tomorrow. Pretty cool, but doesn’t seem as groundbreaking as it has in the past. When we finish with the house, Dad, DH & DS are just walking by so we all head out and head to the Living Seas with Nemo. DD is now hungry because she didn’t eat breakfast, so she & DH go to find a snack and will meet us in Living Seas. I see the clam shells only have a 5 minute wait, so we go in that way. It’s not a bad ride for a 5 minute wait. I know that Dad likes aquariums & animals, so I figured this would be right up his alley and it was. We saw the dolphins and the sharks and the manatee experiment and all sorts of fish. Next up The Land. It’s not quite fast pass time so we go on Living with the Land. I actually really like this. I love to garden, so to see all the stuff they grow and how they grow it is really neat. Everyone else enjoyed it too. Now it’s time to go Soarin! Jackie is getting a little nervous, but we tell her it’ll be ok and keep moving. Thank Goodness! They get off the ride and are glowing, gushing, raving about it . It was so not what they expected and they were absolutely wowed! Now DH grabs all the passes again and goes across the park to get Test Track fast passes. We’ve debated this quite a bit, whether dad could do it or not with his back and he decides to give it a try. While we wait for the fp’s we wander a bit, go thru Mouse Gears (love this store!) work our way up front and Yay! Space Ship Earth is open for previews (we did see it Sat, but had to go again). DS & I go 1st (he likes to ride with me to snuggle, thrill rides he goes with his daddy), DH & DD, then Dad & Jackie. Halfway up, Jackie yells to DH and asks “this isn’t a roller coaster, is it?” Nope, but that would be really cool! The update is good, but I miss the American boy “talking” to the girl in Japan scene. It’s getting to be a long day and certain people are starting to get grumpy. Do we go ride Test Track or back to the room to rest? I’m leaning towards the room, but DH doesn’t want to have to come back to Future World later in the week for Test Track so we push through and go to TT. I like Test Track, but don’t really consider it a thrill ride. Maybe it’s just that I’m in a car, going 60mph that my brain says “that’s slow compared to most days” The “boys” rode in one car and the “girls” in another. Dad thought it was pretty cool and liked it. Jackie may have screamed a bit and yelled something about it being a roller coaster. I think it may have been more than she was expecting, but she was a really good sport about it. Now it’s time to go back to our room. That’s the great thing about staying at Boardwalk Villas, it’s right there. Dad & Jackie came with us, we all stopped at the Bakery on the way to get a snack before our late dinner. Eclairs & cheesecake brownies are really yummy, and very rich. Most were finished for breakfast later in the week. Resting is a good thing! By 7:30 we were warm and ready to go for our dinner in France at 8pm. Les Chefs de France is one of the few restaurants that we haven’t tried before, so we were really looking forward to it. This was also the reason we wanted Dad on the DDP because we knew he would look at the prices and say he wasn’t hungry. This is a really pretty place and the Christmas decorations were very nice. Our waitress was good, she seemed to be “playing” french (distant, snobby) more than the really was. DS had been practicing a few french phrases before the trip and he really won her over with that . Dad & I started with the french onion soup, very good. Too hot for me, but just the way Dad likes it. Jackie and DD tried the lobster bisque, it was ok. DD wasn’t impressed and decided that she just doesn’t like lobster. We told her not to judge lobster based on the soup, it was really bland and didn’t seem to have much lobster in it. DH got to have escargot. He liked it, I don’t do snails, but the garlic butter sauce was very good. DS wanting to be grown up decided to have the kids salad as his appy. It was a nice thought, but not for him. I thought it was good though. DH, Dad & Jackie all the the filet of beef and liked it. Although DH said the filet at Le Cellier was much better. DD, who we thought would get her favorite food, roast chicken, decided trying new foods was pretty cool. She ordered the beef short ribs braised in Cabernet with polenta. She liked it, but didn’t finish it. The Cabernet was very strong, a little too much for her. The polenta was amazing, it was so smooth and creamy. Delicious! DD decided she really liked DH’s green beans (a green veggie? wow). I had the the sauteed scallops & black tiger shrimp with spinach flan and sorrel sauce. I cleaned my plate! I think I had the best meal of the night, the rest were good, buy mine was excellent. Of course with DDP we get dessert, and we were looking forward to it but it was getting late and we didn’t want to miss Illuminations. I had the profiterolles (yum) Dad & Jackie both had the chocolate torte w/banana & coconut (they liked it) DD & DH had the creme brulee, which DS also enjoyed. We kindof rushed through our desserts and made it outside with a few minutes to spare. Now it was getting really cold again, especially after having been inside eating nice warm food. 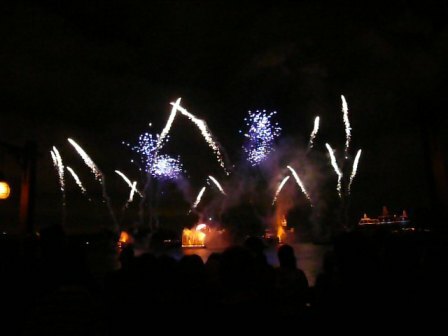 My family loves Illuminations, I have the CD, we know the music & words by heart, so we always sing along when we watch. It was really neat to watch Dad & Jackie though. This is their first time experiencing Disney fireworks. They were amazed! But it was so cold at that point that we didn’t really discuss it. We walked them part way through the park (to make sure they didn’t get lost) told them where to catch the bus and said see ya tomorrow! Other than the transportation issue in the morning, and a little wandering off in Innoventions, it had been a pretty good day. I think they’re really enjoying it. I’m a little tired & stressed making sure everyone is happy (why do I try? It just drives me crazy ) Time to go warm up and rest. Tomorrow is the Christmas Party!